One section of ‘Chapter 2: Conventional Responses’ in R. Slaughter’s book, The Biggest Wakeup Call in History (BWCH), refers to ‘missed and misused signals’ during the past 60 years. Precisely because these ‘signals’ have been ‘missed’ or either ‘misused,’ it is important to review their historical relevance, for many of them still serve as ‘foresight reminders’ that global civilization can only afford to ignore at its own peril. Though the window of time is still open to change course, it is at the same time rapidly closing, and as it closes so goes the options available for alternate/preferable futures. Thus, this section is meant to review the relevance/pertinence of these sources in more detail than given in BWCH. Now, in reference to the ‘Missed and Misused Signals’ section, a number of carefully researched works during the twentieth century, particularly during the past 60 years, provided humanity with a wide range of relevant signals about the ‘state of the world’; however, these signals were not only ignored and denied but also, in many cases, they were deliberately undermined and distorted by ideologues representing the Powers That Be, expressly for the sole purpose of maintaining the present, disastrous course of business as usual. Dr. 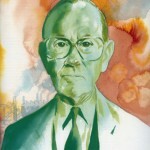 Slaughter refers to a number of works from the US and Australia: in 1956, the publication of Hubbart’s Peak – a graph that accurately predicted the peak of US oil production within mainland American by 1971; R. Carlson’s publication of Silent Spring in 1962, describing the impact of pesticides on birds (and other living creatures); P. Elich’s Population Bomb, though overstating the immediate dangers of population growth, nevertheless, drew attention to the long term dysfunctional aspects; Frank Herbert’s anthology for Earth Day 1970, provocatively entitled, New World or No World, dramatically capturing the sense of the fundamental changes needed in the U.S. and, by extension, other developed (or over-developed nations); speeches by Jimmy Carter and his chief environmental advisor, Gus Speth, alerting the impact and dangers of global warming (at a time when it had not yet been fully accepted by much of the scientific community); likewise, Jim Hansen, a respected NASA scientist and well-known environmentalist, who made many valiant attempts to get global warming on the U.S. agenda. 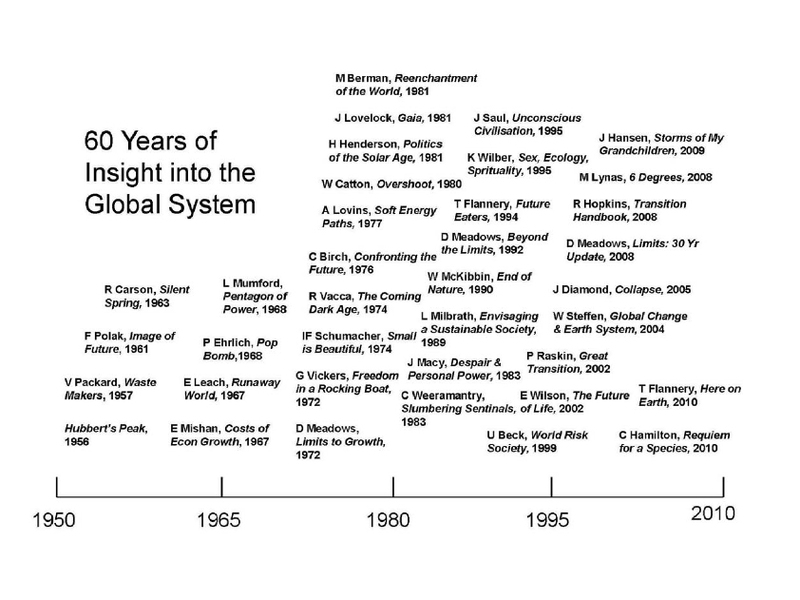 Australian sources include C. Birch’s Confronting the Future, the Australian Commission for the Future (initiated by then Science Minister, B. Jones), C. Hamilton’s Scorcher, Australia 2020: Foresight for Our Future (by M. James of the Parliamentary Library, Canberra), The Canberra Futures Forum, and The Australian Foresight Institute. A visual commentary of these and related issues from Part One of BWCH can be found here. Another individual who took this work forward was Charles Birch, Professor of Biology at Sydney University. His Confronting the Future, first published in 1976, is a clear, modulated, articulate and well-researched overview of these same issues but with an added emphasis on their human, ethical and value dimensions. Three items are provided here. First, an outline of the 1994 update; second, an interview I conducted with him in that year; third a short paper that I wrote a few years later. The latter was a forerunner to my later more in-depth treatment of these issues – The Biggest Wake-Up Call in History. 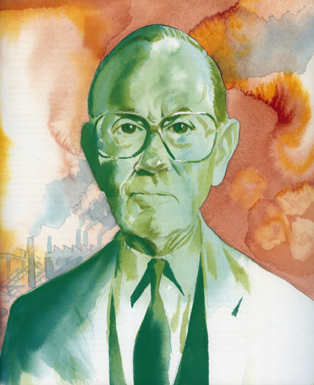 The image of Charles Birch is by Spooner from issue 1 of the Commission for the Future’s magazine 21C, 1995. Read an outline of Charles Birch, Confronting the Future here. A 1994 interview with Charles Birch can be found here. Later Than You Think (2006) can be accessed here.